Sarah Isabel Hinshaw1,2,3,4,5 [Isabel Hinshaw6, Belle Hinshaw5]. Our place had quite a sensation Aug. 6, occasioned by the marriage of one of our young ladies, Miss Belle Hinshaw being married to Allie Reynolds. We are sorry to lose Miss Belle from among us, but our loss will be Mr. Reynolds' gain. 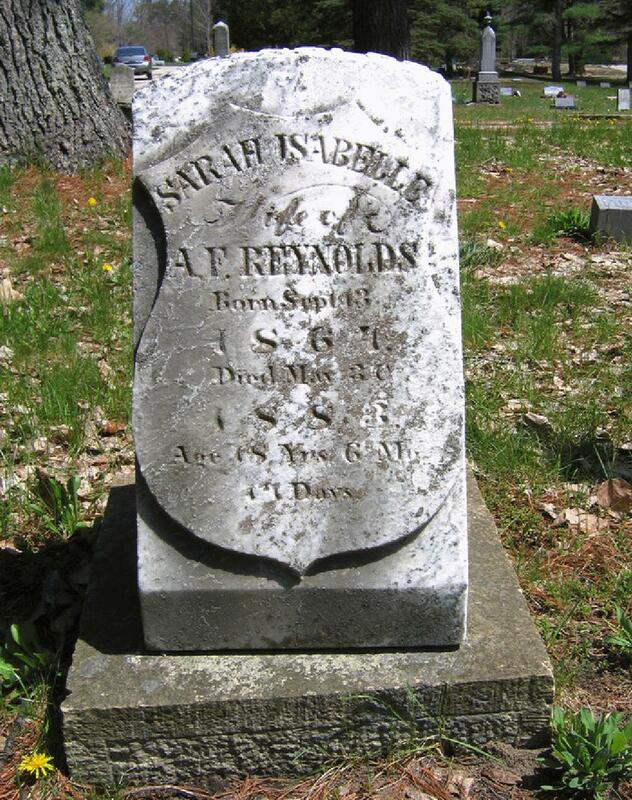 Sarah Isabel Hinshaw died May 30 18835 [May 1 18831], Long Lake Township, Grand Traverse County, Michigan5 [Cedar Run, Leelanau County, Michigan1]; age 18y 6m 17d5. Mrs. Allie Reynolds (better known by her maiden name, Miss Belle Hinshaw) died last Wednesday morning. Mrs. Reynolds had become greatly endeared to the entire community. Her sweet life was full of hope and promise, but the Lord willed otherwise, and her friends, especially among the young people, will long mourn for a dear one gone. The funeral services bore affecting testimony to the tender regard in which she was held. She was eighteen years old, and they were indeed "beautiful years." She was buried at Long Lake cemetery, May 3d [sic], Rev. Mr. Hodgens officiating. Family from Indiana arrived for the funeral: Mrs. Russell, aunt of the late Belle Reynolds, living in Indiana, was telegraphed to and came and attended the funeral of Mrs. Reynolds.